God Doesn’t Want Your Resolution, He wants You! Today is the last day of 2013. Tonight, we will celebrate the passing of the old year and the dawning of a new one. Like millions of other people last year, like every year before, I made a series of New Year’s Resolutions. Among other things, I wanted to read more, lose weight, get into better shape, and spend more time with my family. In addition to these personal resolutions, I also made some spiritual one’s — spend more time with God, increase my giving to missions. 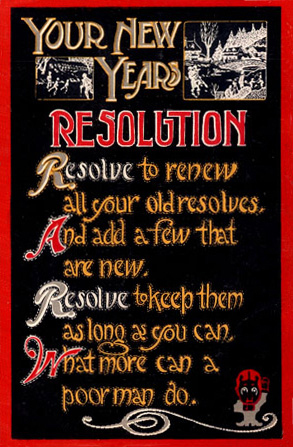 Sadly as I look back none of these resolutions were ever kept. It wasn’t because they weren’t noble commitments or that I was half-hearted in making them. Honestly, it was the very nature of a resolution that got into the way. This morning as I contemplated a New Year and prayed about the opportunities that lie ahead in the next twelve months , it dawned on me that God doesn’t want my resolutions, He wants me. And He wants you as well. You see the nature of a resolution is self-centered and self-empowered. This is diametrically opposed to the gospel which teaches us to be completely dependent on God. In John 15:5 Jesus says, “I am the vine; you are the branches. Whoever abides in me and I in him, he it is that bears much fruit, for apart from me you can do nothing.” This verse reminds us that in the strength of flesh we can accomplish nothing of value, but through Christ empowering our lives we can bear much fruit. The key word in this verse is abides. To abide in Christ means that we are utterly and completely surrendered to His will. Rather than attempting to do things for Christ this verse teaches us that He wants to work through us. But in order for that to happen we must be surrendered to His will, His mission, and His ways. So this New Year’s Eve instead of making resolutions, I want to urge you to surrender your will to His.